"This is a problem that affects every area of the city. If you look at our overdoses in the last year or two, there is not one neighborhood that is not touched by this." NEW ORLEANS -- For a few years now, emergency room doctors have been sounding the alarm about the overdose epidemic from opioids, such as heroin. But now a city map shows just how great the public health problem is and what areas are most affected. At first glance, the map looks like an ominous weather radar shot of the city, but in this case it's not rain that's falling from the sky, it's human lives falling to the destruction of drugs in the last two years. "This is a problem that affects every area of the city. If you look at our overdoses in the last year or two, there is not one neighborhood that is not touched by this," said the New Orleans City Health Director Dr. Jennifer Avegno. The New Orleans Health Department says the red areas represent eight to 74 overdoses, where EMS went to the scene. It doesn't even include those driven to the ER in a private car. 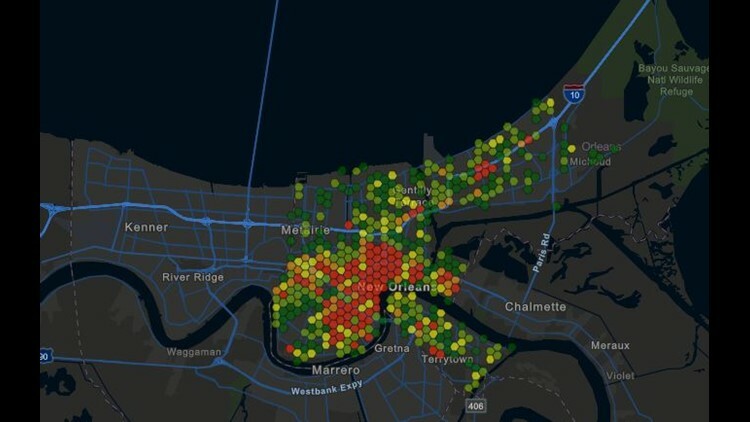 We went to one of the red areas, the Upper 9th Ward, to talk about this serious public health issue. "I go out to my car one day in the middle of the street, and I hear a crunch under my boot, and I'm like, 'What the hell was that?' And there's a needle laying under my foot. And I'm looking around my vehicle. There's four heroin needles just laying around my whole car," said a young man who works in the area. "I feel pretty upset about it because I live in the area. A couple of times, we found needles on the floor," said a young woman who lives nearby. "Bad, because kids just killing kids. Drugs man ... they need to stop," said a middle-aged man. There are not enough places that treat the illness of addiction to meet the high demand of patients. The City Health Department is putting on free classes on how to use NARCAN, to get an opioid user who is not breathing, to breath again. You can get the nasal spray at any pharmacy without a prescription. And soon a new program will begin at UMC for those lives saved by paramedics and emergency room doctors. "Connect them with a recovery specialist right then and there, who can help them walk, understand what the process is like, figure out their options and then follow up with them. They make it more likely that they will get the treatment that they need," Dr. Avegno said. And with that follow-up, they are hoping to end the chronic cycle of addiction. The next free class on how to use NARCAN is Saturday 11 a.m. at the St. Bernard Public Library.